tweets, as well as @revrichardcoles for a breath of fresh air. line at a different point. no-one would be saying anything. Hugo needs is more evidence. A LOT more evidence. learn a little bit more about cancers and probability. New results from the ATLAS experiment at the #LHC! Chi_b (3P) state, which is a quark combo of a beauty and anti-beauty. dreams recede even further (as seems fairly likely, I have to admit). Perhaps anyone better acquainted with the physics can enlighten me? A little design modification & fan-assist. 500ml paint can shell, 400ml soup can pyrolysis chamber, further 400ml can support & fan duct for primary air. This design works *really* well! Good 15-20min reliable burn, lots of heat out. 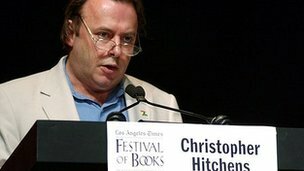 I was saddened to hear on the BBC that Christopher Hitchens has died. He has rolled up the curtain, but not joined the Choir Invisible. Not for Hitch, that going gently into that good night. He went out, all guns blazing against the sanctimonious vultures of religion, those cackling gargoyles who cajoled and harangued him to renounce his "outspoken atheism" and embrace the clying comforts supposedly offered by a belief in Santa or the Afterlife or the Baby Jesus or fairies or some such. In such a prolific career there is probably much to disagree with, but we can be thankful to Hitchens that he has left the world a much wiser and better place, and he has encouraged many people to stand up against the affront that organised religion/superstition presents to basic human dignity. Well done, sir!